Fever-Tree Tonic vs Q Tonic - Which Is Better? NOTE: this review has been replaced with a new, larger roundup, which you can read here. I have already rewritten and updated the recipe for making tonic water from scratch, which you will find here. In January, I reviewed Q Tonic. Now Fever-Tree Tonic, another gourmet version has hit local store shelves. I thought it was time to go back and update this post with a comparison between the two. Gin and tonic – what my dad would call “an honest drink.” No fancy juices – direct and to the point. Just about anyone should be able to take three ingredients and, measuring, come up with a good cocktail. Unfortunately, this doesn’t happen very often. The average bartender, whether at home or in a bar, grabs for a bottle of Schweppes, or even worse, squirts the tonic out of a gun, and ends up with an overly sweet drink that has little in common with the original concoction. I was going to put some history of tonic water, but when I was researching it, I came across a great essay on the Q Tonic site. It is the best I’ve found, so I’m just going to add it here. Tonic water’s story begins two centuries earlier, in 1638. The wife of the Spanish Viceroy in Peru, the Countess of Chinchon, had fallen violently ill with malaria. Her husband begged the local Incas for an antidote. In a show of generosity, the Incas instructed her to drink a potion containing the ground bark of the native “Quinquina” tree, which grew on the slopes of the Andes. The potion worked and she quickly recovered. In her honor, the Spanish renamed the Peruvian tree the “Cinchona” tree. They also killed off the Incas, stole their gold, and colonized their land. The ground bark was then imported to Europe and quickly prized. But Peru prohibited exporting Cinchona seeds. So, as colonialism and hard-drinking officers created more need, the supply of Peruvian Cinchona bark could not keep up with demand. Prices skyrocketed – at one point, the cost of the bark powder was its weight in gold – and the bark was overharvested. The Cinchona tree became nearly extinct. In a coup reminiscent of coffee’s spread, 1862, Charles Ledger smuggled Cinchona seedlings out of Peru and sold them to the Dutch government. Holland set up large plantations in Java, their colony in Indonesia. Until World War II, Indonesia supplied almost 95% of the world’s quinine. However in the winter of 1942, Japan attacked and took control of Indonesia to secure oil for its war machine. With battles raging in areas with malaria, the Allies established a mini-Manhattan project, charging scientists with finding another source of quinine. The group soon discovered a way to produce a synthetic substitute. Following the war, the corporations producing tonic water elected to switch to this cheaper, artificial quinine. Tonic water lost the authentic ingredient that had defined it for centuries. Over the last few years, however, there has been resurgence of interest in the original quinine water. At first, Q Tonic dominated boutique grocery store shelves, but now Portland is starting to have a choice, with the addition of Fever-Tree Tonic Water. Two things catch my eye: First of all, the bottles are quite nice – I’d even call the Q Tonic elegant. The prices also catch my eye. I’ve seen them between $2 and $3 per bottle, which the packaging claims is the perfect size for one drink. For that reason, I never bought any until I ran out of my homemade tonic. Q Tonic: purified water, organic agave (for sweetening), Peruvian quinine, Lemon juice extract, natural flavors. Fever-Tree: spring water, cane sugar, citric acid, natural flavors, Rwanda/Congo quinine. Schweppes: carbonated water, high fructose corn syrup, citric acid, natural flavors, sodium benzoate, quinine. While it’s nice to have a tonic with natural, healthy ingredients, what matters more is the taste. I recently sat down with fellow gin lover Nancy Rommelmann for a comparison. The first thing that got our attention was the smoothness of both Q Tonic and Fever-Tree. I could see drinking either of them over ice. This is something I would never try with the mass-produced varieties. Q tonic has a somewhat medicinal taste from the cinchona bark, which reminded me of my homemade tonic. I also noticed a very slight tartness and tang, and a clean-tasting light fruitiness that matches the elegance of the bottle. Fever-Tree is a bit lighter. The aroma is fresh and citrusy, as is the taste. It is quite a bit smoother than Q Tonic; balanced and very easy to drink by itself. My only complaint is that the flavor is a little bit too limey; but for those who prefer their tonic drinks with lime, this may be the best choice for you. The particular characteristics of various brands of alcohol make a big difference on how well they match with mixers. I’m not a huge vodka fan, but over a few evenings, I tried both brands with several varieties. Every version of Q Tonic vodka tonic was excellent; a good match that perked up even the most banal vodka. Fever-Tree didn’t fare so well with me, I just didn’t care for it with Vodka. Mixing them with gin was a slightly different experience. I had to determine if I was looking for the authentic, somewhat medicinal clash between the two liquids, or complementary smoothness. It is definitely a matter of personal taste. For a smoother, citrus taste, I would go with Fever-Tree, but for a more homemade, traditional tonic taste, I choose Q Tonic. Both, however, are excellent, and far better than Schwepps. With gin, the brand you use makes a big difference. Of course all of them need to have juniper as their dominant flavor, but other botanicals distilled into each set them apart. My everyday drinking gin is Plymouth, because it is decent and relatively inexpensive. I thought the two worked well together; though the tonics tended to overly smooth some of the herbaceous notes. If you like a really mellow combination, this might work well for you. The same was true with some excellent Bluecoat American Dry gin I had left over from Tales of the Cocktail. With big gins like Beefeater, I found it completely overwhelmed – you might as well use soda water. When it comes down to it, the tonic you are going to like depends on your personal taste and what brand of liquor you want to mix it with. The biggest question is whether the boutique versions are worth the price. I like my own recipe, and if I had lots of time and energy, I’d make it every time. However, both of these tonics will satisfy; chose by the characteristics that are important to you. Whatever direction you take, enjoy your drink, and think about this: Tonic water will fluoresce under ultraviolet light. In fact, the sensitivity of quinine is such that it will fluoresce in direct sunlight. Make a drink and go outside to frolic on a sunny day. It’s for science! Category: Product Reviews, Product/Business Reviews. Previous Post: « No Dogs at Farmers Market, Suze Orman Miscalculates and More! Wow – this was a wonderful post. I love tonic water straight and am headed down to Zupans for some Q Tonic right now. I actually like the taste of Schweppes, although I know most people think I am nuts for drinking it straight, but I am sure this will be even better. I would also love to have your recipe for homemade. In the quantities of tonic water I drink, the Q Tonic will be cost prohibitive and will have to be saved for special occasions. I have had many 2 liter days and that would be $25 worth of Q Tonic. But, my biggest problem is that diet tonic water is just yucky and I am allergic to corn syrup. If I drink the regular Schweppes I either have to take lots of Allegra or put up with very itchy hands or both. If I could make my own, using cane sugar, I would be in heaven. Fever-Tree makes a Diet Tonic water that is just as wonderful as the regular Tonic. It is made with fruit nectar instead of pure cane sugar so it is literally half the calories. We have done side-by-side tastings and you cannot tell the difference between the two. If this is the diet sweetener then I will give it a try. I didn’t even pick it up to read the ingredients due to the usual suspects used. Thanks for the info! Tell me you’ve been to Teardrop. Their tonic is incredible. And now if only there was some direct sunlight to test your fluoresce claim! Heck, I reviewed Teardrop. I’m not a huge fan of their tonic though, I prefer Kevin Ludwig’s recipe at Park Kitchen. Not sure if they still have it though. I’ve seen it at Zupans, and Pearl Liquor among other places. I bought mine at world cost market! I switched over to Q this last year, but mainly because it is the only tonic I could find that did not use High Fructose Corn Syrup, an ingredient I’ve been trying to eliminate from my diet. I love the stuff, but agree that it really varies from tonic to tonic. I have not tried it with vodka. After reading this review, I will have to try some vodka with it. While I like Q, for the most part I think tonic, any tonic, steps on gin in a way I don’t like. Last year, I switched to gin & soda water; occasionally, my husband will add a dash of Peychard’s bitters, which I still think is prettying things up. The only thing I want in the gin — and I’m with Dude on Plymouth, my very favorite — is lots of ice and a little club soda. Thanks for this review FD. As often, I find your prose timely. With the sun(ishness), out come the G&T’s. I too found Q too sweet with my more fragrant liquor, good with vodka. I’m with Nancy in regards to my distate for stepping on the more infused. Shake together with ice, and strain into an ice-filled highball glass. Top with tonic, and serve. I had no idea about any of this – thank you! I realize taste is personal, but I’ve found that Fever Tree combined with Tanqueray’s Ten gin is about the best thing I’ve ever tasted. I’d highly recommend anyone giving it a try. I read that Ten Gin was the perfect gin for martini’s, but that the standard Tanqueray was better for tonic drinks. I have not (yet) purchased any of the former, as it is a bit pricey, but since I love Fever Tree, I’ll have to give your suggestion a try. Thanks. Club soda, quinine powder and agave nectar, perhaps? Great post by Food Dude, thanks. It was really helpful because I just tried Q after using Fever Tree with Plymouth and was amazed how different the drink tasted. I agree with your assessment that Fever Tree does create a “smoother, citrus taste” which is more refreshing to me. Thanks again. I have been drinking Vodka with QTonic for over a year now and it’s about $7.99/4pack at Whole Foods and a local wine shop. More and more places are bringing it in. A local liquor store has it for $7.49. It makes a wonderful vodka tonic and isn’t sickly sweet. Makes you appreciate the drink and actually sip it instead of gulping it down with the cheaper varities. Fantastic article, thanks! Just before reading this post I read your one on making tonic water-your decent into madness. I have worked in the restaurant industry and know what you mean about the tonic coming out of the dreaded soda gun. I mean, man the lines running to those guns can get sooo nasty! Keep up the great reviews. Heads up to everyone as Fever-Tree has recently launched a Mediterranean Tonic Water. It is a delicate more floral tonic meant to better pair with Vodka’s specifically and is made using lemon thyme, rosemary and citrus. 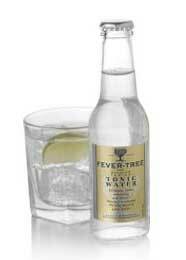 I recently tried Fever Tree and found it a welcome diversion from the generic tonics. I would have looked into Q, but since you were kind enough to show me the ingredients, and agave makes me sick to my stomach…Fever Tree it is! Fever Tree hands down. The carbonation is better making the flavor brighter, and they have a light version too. While Q is damn good, I think you are over paying for the designer bottle. Something new: Mezcal Pierde Almas is releasing the world’s first Mezcal-Gin on April 15th (in Seattle). Since there is no Mezcal-Gin category, creator Jonathan Barbieri, is calling it Mezcal +9 (for the nine classic botanicals that are infused into the Espadin Mezcal during the third distillation). I had the opportunity to taste one of Barbieri’s G&T’s and was blown away, so he gave me the recipe and a bottle of his pre-release Mezcal +9. I’m afraid that bottle was emptied long ago, but I will share the recipe in case you’re able to get your hands on a bottle or two from his first shipment. Salud! Where can I get Fever Tree Tonic in the Chicagoland area? I have started using the SodaStream tonic. Rather than adding it the mix to the bottle, I just add a little bit to my drink. No more wasted bottles of half-flat tonic water, and I can sweeten it as much as I want. I’m pleased with the taste too. I’m curious if others are doing this too. Great article and QUITE informative. I’ve been drinking gin and tonics for years, and was always happy with Gordon’s and Schweppes, but then I found Fever Tree in a store and bought some. WHAT a difference! Then I couldn’t find it, and had to run around to find Hansen’s, until our Trader Jo’s decided to no longer carry it (Hansen’s is also NOT made with corn syrup)., and then Q. Now I’m having fun finding out which gins work best with each, and I’m sure I’m becoming a bit of a snob. However, I LIKE the strong juniper gins, and find nothing objectionable in Beefeater, Tanqueray, or (gasp) even Gordon’s or Gilbey’s, but the gentler gins are not bad either. What a lot of fun. Have not tried Plymouth yet, but I certainly will. There is a LOT of hot summer still to while away. Oh, and if I had to vote, mark me up for Fever Tree. The wife loves it straight, in fact. I am madly trying to find a low carbohydrate tonic water to replace the sugar free Hansen’s that Trader Joe’s stopped carrying. I am suspecting Hansen’s no longer produces it, as it is “unavailable” on Amazon. com (Hansen’s online seller). Diabetics: what are you doing for low carbohydrate gin and tonics?? I almost gave up on G&Ts because i detest the high corn fructose and the diet tonic is not even an option. At a casino here in AZ, I was served a GT from a cute little bottle. i grabbed the bottle – FeverTree and Googled… and here I am on this site!! I am SO thrilled to get away from that horrid fructose! And now I can drink…. except I don’t know where to buy this stuff, so that’s why I Googled. i shall persevere because I am motivated! (It’s 80° out!). And my very best is green Tang. because I think it’s the most juniper-y. I tried the Fever Tree Ginger Beer..best I’ve ever had. looked up the company and read about the all natural ingredients from sourced from all corners of the planet. I ended up buying stock in the company..Hope they prosper. my favorite tonic is Jack Rudy”s Small Batch tonic syrup. Just mix with perrier or soda and Citadelle gin for the G & T I have ever tasted. One bottle lasts a long time for about $17.00 a bottle. A good dose of quinine with lemon grass, orange peel and sugar! Went through that experience with Trader Joes discontinuing the little Hansen’s aluminum cans. JUST DISCOVERED they now have the same size cans with their own label and it makes a pretty decent G&T with TJ’s (Rear Admiral Joseph’s) relatively cheap gin. Question: is there any real quinine in “natural quinine flavor”? That’s one of the ingredients along with cane sugar (no high fructose corn sweetener), citric acid, natural lime with other natural flavors. In this blog I didn’t see any comments about the importance of the water source for the ice cubes; I think it makes a big difference and I prefer them made with distilled or at least RO purified water. I sometimes visit a friend who makes them with ice from his refrigerator’s ice-maker which hasn’t had a filter change for years, and it definitely reduces my enjoyment of his Gin & Tonics! Would you care to share your tonic water recipe? We love both the Fever tree & Schweppes both make amazing cocktails with gin! But since we had a fever tree bottle explode & cut open my husbands head & ear it’s cans all the way now for us!. Crater Lake Gin has become my favorite. 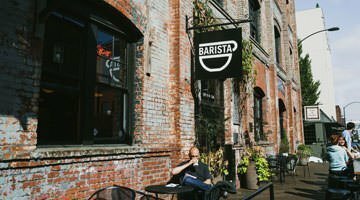 It’s made here in Oregon yet seems bars & eateries seldom have it available. Have you tried it? I have tried both Fever Tree and Q, and would vote for Fever Tree with Hendricks. bottle. I buy the large bottle but most of it goes flat before I can finish it. Cannot find a carrier in my area except Wegmans. For some reason they only carry the large bottle. At one point they were carrying both sizes. Please help me find the small bottles in my area..
My perfect G&T. Heaven in a glass on a hot Virginia summer evening. Cheers! Can anyone tell me how much quinine there is in Fever Tree Tonic?